In this book you will find rules for determining a multitude of things. The opening section details a myriad of potential human encounters in civilized, barbarian and wild lands. In this system, not only is the type of culture taken into account but the size of the party, its motivation for being where it is and other important factors. As a whole, the human encounter rules provide a detailed overview of many essential encounters that can occur in human areas. Following these basic rules, you will find a precisely detailed section of rules governing encounters inmajor population centers. These city rules detail the unique encounters that can occur in the fantastic city. Rounding out the human encounter rules is a section for generating unique, random humans. With these rules the Referee is allowed to vary his encounter whenever the need, or desire, arises. The final section of this book is a detailed system for generating an infinite number of unique treasures. 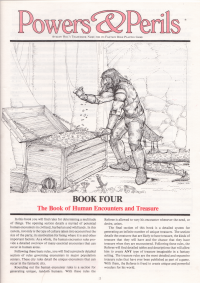 The section details the creatures that are likely to have treasure, the kinds of treasure that they will have and the chance that they have treasure when they are encountered. Following these rules, the Referee will find detailed tables and descriptions that will allow him to create ANY type of treasure imaginable in a fantasy setting. The treasure rules are the most detailed and expansive treasure rules that have ever been published as part of a game. With them, the Referee is freed to create unique and powerful wonders for his world.